With a few exceptions (cough Ella Enchanted cough cough) I love when books I like get made into movies. Even if the movie isn’t great it generally makes the book more popular and it’s cool to see someone else’s interpretation of it. And sometimes they are amazing! Here are some upcoming book to movie adaptations I’m looking forward to. I had to rely heavily on the Internet to find out what was in development, so don’t blame me too harshly if some of these don’t turn out to be true. I read about each of them somewhere, I promise! 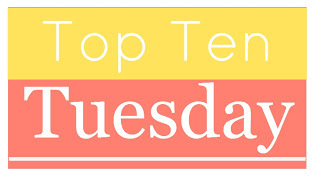 This entry was posted in top ten tuesday and tagged books, movies, Top 10 Tuesday, Top Ten Tuesday by Alison Doherty. Bookmark the permalink. I had to put the internet to use as well. 🙂 I like your list. Mockingjay made mine too. I finally got around to seeing the first part and am dying to see the second. Allegiant is another one I really want to see. I just wish we didn’t have to wait until next year. I haven’t read The Jungle Book and don’t know that I will, but the new live action Jungle Book movie looks awesome from the trailers I’ve seen. I don’t think I’ve read The Jungle book either, but the movie looks beautiful! Looking for Alaska? Grasshopper Jungle? My mind is blown. I want to see them, too. Hopefully the movies will actually come out and the Internet isn’t just lying to me. I am really nervous about Me Before You. Only because it’s one of my favourite books of all time and I really, really don’t want it to be ruined for me. Argh!!! I totally get it. I’ve read the book too, and I think it is going to be a hard story to pull off. Fingers crossed they get it right. Thanks. I would love to see that fantasy world come to life! Me too! I love when they turn YA novels into movies (obviously). I don’t want to watch Mockinjay. I know what will happen and I don’t want to see it. But I have to watch it! I know how you feel. I’m excited for the movie, but I think it could be really tough to watch emotionally. Thank you! So many good book movies coming out! I didn’t know An Ember in the Ashes was turning into a movie! Now I really need to hurry up and read it. Mockingjay part 2 cannot come soon enough. Yeah. I don’t know what part of the process An Ember in the Ashes is in, but it definitely popped up on a few lists for YA movies to watch for. Thanks for commenting! I’m so excited for the Fantastic Beasts movie!! The photos they’ve released so far are amazing! I’m glad I’m not to only one who was disappointed by Ella. Fantastic list! The Grisha trilogy almost made it on to my list, I heard it’s been optioned so fingers crossed! Yeah. I would love to see Ravka and how they handle the grisha magic! I really need to read The Grisha trilogy and … The Hunger Games! Shocking. Really looking forward to the movies though! I definitely recommend reading both trilogies though too … if you have time. Looking for Alaska could be a major sobfest but you know I’d see it! Cool! I’ve seen it on a lot of people’s lists for this topic. Can’t wait for Mockingjay Part 2! I am so excited for Mockingjay Thursday. SO excited. Oh my gosh me too! Cant’ wait to read about what you think of the movie!